and the even more devastating loss of lives. 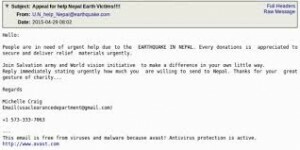 CyberCriminals are using the disaster in Nepal to trick people into clicking on links, on Facebook, Twitter, and phishing emails. 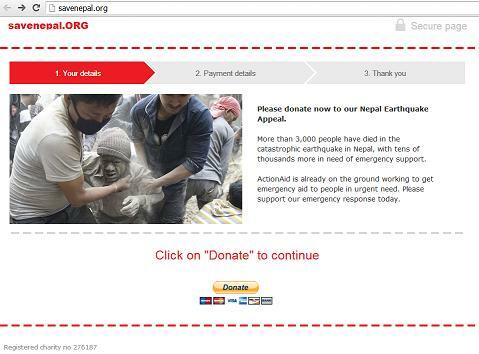 They say they are trying to solicit charitable giving for the earthquake victims. The scams that are exploiting the disaster are so abundant, and have victimized so many people, that the FBI has issued a public warning about the scams. Facebook pages ‘dedicated to victim relief’. These pages contain links to scam websites. Tweets with links to ‘charitable websites’ soliciting donations. The links are really spam links or links that lead to your PC or other device being infected with malware. Emails requesting donations to the Nepal Earthquake Fund. These are really phishing emails, which lead to your PC or device being infected with malware. Do not respond to any unsolicited (spam) incoming emails, including by clicking links contained within those messages, because they may contain computer viruses. Be cautious of individuals representing themselves as victims, or officials asking for donations via email or social networking sites. Beware of organizations with copycat names similar to, but not exactly the same, as those of reputable charities. Be cautious of any emails that claim to show pictures of the disaster area in attached files, because those files may contain viruses. Only open attachments from known senders. Avoid cash donations if possible. Pay by debit or credit card, or write a check directly to the charity. Do not make checks payable to individuals. Most legitimate charities maintain websites ending in “.org” rather than “.com”. 1. 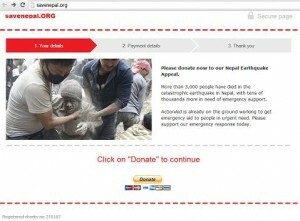 Go to the website of the charity of your choice and make a donation. Type the address in your browser. DO NOT CLICK on any links in emails, texts, or tweets you might get. 2. Check out the Canadian Red Cross or American Red Cross. 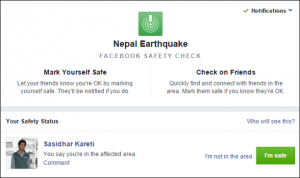 They can tell you how you can donate to the Nepal Region Earthquake Fund. **Note: the Government of Canada will match eligible donations made to Nepal Region Earthquake Fund made through the Canadian Red Cross. You can’t stop CyberCriminals from targeting you. But you can be prepared for their arrival, and have full shields up.